At the age of nine and a weight of 75 pounds, Randy Romero began to make a name for himself on the quarter-horse bush tracks of Southwest Louisiana. Every weekend leading up to his 16thbirthday, he rode the Louisiana Cajun racing circuit which included Hebert Downs in Abbeville, Coteau Downs in Coteau, Broussard’s Racetrack in Maurice, and Carencro Raceways in Carencro. By the time he began his professional riding career in 1975 at Evangeline Downs in Lafayette, LA, he was already a well-known and seasoned rider. His riding skills, passion, and notoriety made him a much sought after jockey who was never short on mounts. In that same year, he finished third in the All American Futurity in Ruidoso, NM, aboard Rocket’s Magic, a horse trained by his father, Lloyd Romero. Both the horse and Romero’s young riding career caught the interest of movie producers. The classic, Casey’s Shadow, released in 1978, would spotlight Louisiana’s native son. His love for the sport at such a young age fueled a fire in him that would lead him to achieve some of national horse-racing’s top honors. Romero was born into a racing family on December 22, 1957 in Erath, LA. He attended Erath High School, graduating in 1975. His grandfather, Henry Romero, and his father, Lloyd, owned and trained quarter horses. Randy first got his start on the backs of his father’s horses and other local trainers in the area. Later, he would be at the reins for his brother and horse trainer, Gerald Romero, at Louisiana Downs in Bossier City, and at the Fairgrounds in New Orleans. In 1983, at Oaklawn Park in Hot Springs, AR, he suffered a major setback that nearly ended his career. He was burned over two-thirds of his body from a freak fire that erupted while he was in the sauna. Through seven months of rehabilitation, he was determined to get back in the saddle again. He returned to racing at the Fairgrounds in New Orleans, winning three of four racing titles and setting a track record of 181 wins. Nicknamed the “Ragin Cajun,” Romero was also often called the “Ladies Man” for his success in riding fillies. One such mount was Personal Ensign, who went undefeated in 13 races from 1986 to 1988, and was named to American Horse Racing’s Hall of Fame in 1993. To commemorate both the horse and her regular jockey, there is a life size bronze statue of Romero aboard Personal Ensign located in Thoroughbred Park in Lexington, KY. Another notable mount was Go For Wand, which Romero guided to victories in seven major races during 1990. In her last race at Belmont Park in the Breeder’s Cup Distaff, Go For Wand was ahead by a length at the 16th pole when she broke down from an open fracture to her right cannon bone. As the horse fell, she threw Romero, who fractured his pelvis and broke several ribs. The horse was euthanized and Romero spent the next four months recovering from injuries. While Romero met with great success as a jockey, the down side of his career were the race-related injuries requiring over 20 surgeries. Due to health issues, he retired in 1999 at the age of 43. For a few years he worked as a jockey’s agent and for trainer Dallas Stewart. 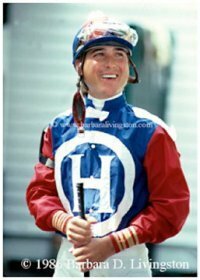 In 2004, along with Shane Sellers, he was featured in an HBO documentary entitled Jockey, about the health problems resulting from racing injuries and the long-term effects of bulimia as an attempt to maintain low racing weights. His career was the subject of a 2010 Horse Racing Television’s (HRTV) Eclipse award-winning documentary, Inside Information: Randy Romero. In 2010, Randy Romero’s Remarkable Ride was written by Bill Heller and published by Pelican Press. The book is a testament to his stellar career, strength, and fortitude. Romero was also featured in a recent documentary, Cajun Jockeys, which takes him full circle back to the stories of the bush tracks where it all began for him. During his 26 year career, Romero won three Breeder’s Cup races, 122 stakes races, and riding titles at ten different race tracks including Belmont, Arlington, Gulf Stream, Hialeah, Keeneland, The Fairgrounds, and Louisiana Downs. He became the first rider at Keeneland to win five consecutive races in a day. Nine of his 26,091 mounts were in the Kentucky Derby at Churchill Downs. He’s ridden internationally at race tracks in Tokyo, Hong Kong, England, France, and Canada. He’s tallied 4,285 career wins and total career earnings amounting to $75,264,198. Romero has one son, Randy Romero II, and three grandchildren, Tyler, Mia, and Mason. After having lived many places across the US, Randy returned to Acadiana a few years ago and is currently back at home in Erath.